First Prize Food for Thought by Student Employees of Columbia University Library. 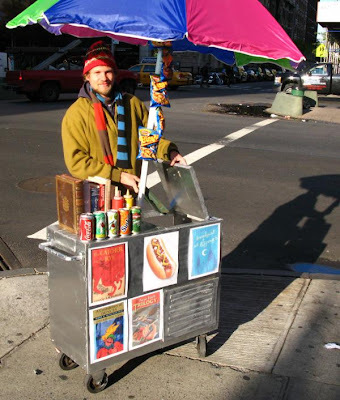 Author comments: Hot dog carts and used book vendors are a staple of any New York City sidewalk. A team of student work-study employees at Columbia’s Butler Library drew on this urban inspiration to transform a vintage wooden bookcart into Broadway’s hottest book stand. 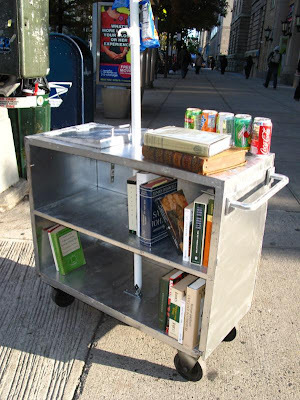 Having wheeled the refurbished bookcart from the quiet library stacks to the bustling corner of Broadway and 113th Street, Columbia undergraduate Evan Roth poses as a book vendor to the amusement of even the most jaded New Yorkers. 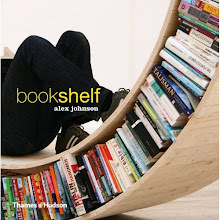 And then it’s back to the library stacks to serve up fresh books!